On August 11, 1817, Emory Johnson became the first of five children born to Jared and Sally Johnson, farmers in Chatham, Connecticut. At 16 he moved to East Haddam and took up wagon making, a career he pursued until the age of 22. It was then that he went to work at a mill erected by local business pioneer Stanton S. Card, where workers turned raw cotton into high-quality twine. Johnson married Card’s daughter, Eliza, in 1838 and partnered with his father-in-law, and brother-in-law, Jonathan Cone, in the running the family business. Card ultimately presented Cone with a financial interest in the company’s upper mill and Johnson with a stake in the lower mill. Around the time hostilities between Northerners and Southerners erupted in civil war, Johnson sold his interest in the lower mill and erected a third twine mill located between the original two. 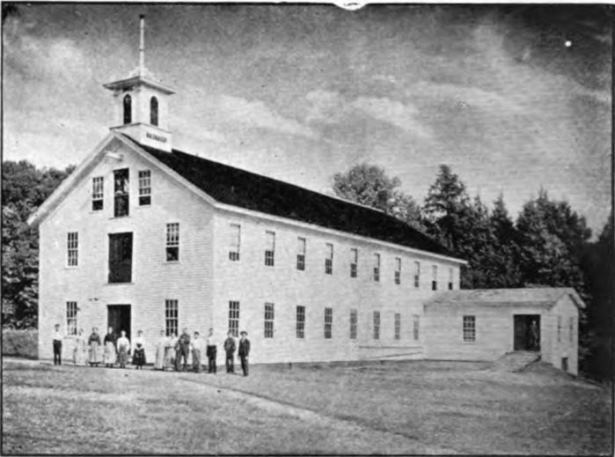 His business acumen brought the mill substantial success throughout the war and Johnson became a fixture in the local community, serving both in the state legislature and as the superintendent of the local Sunday school. With Stanton Card’s death in 1867, Johnson reacquired the lower factory and modernized it. Now operating under the name “Neptune,” the twine manufacturer employed upwards of 30 people toward the end of the century, with a monthly payroll of $1,000. Johnson erected numerous dwellings around his factory, and the area, which later acquired a post office and a library, became known as Johnsonville. After Emory Johnson died in 1896, his son, E. Emory Johnson, took over the Neptune twine business. He oversaw a major overall of the mill property that included painting and repairs, as well as the addition of new machinery that doubled the mill’s capacity. In 1904, the Neptune facility continued operating out of multiple buildings. The most significant of these was the four-story lower mill—measuring 36 × 80 feet and offering carding on the first floor, spinning on the second, twisting and winding on the third, and packing and baling on the fourth. Despite all of Neptune’s success in the late 19th century, however, changes in economic climate and demand for Neptune’s products ultimately drove the company out of business in first half of the 20th century. In the mid-1960s, entrepreneur Raymond Schmitt bought the Neptune property and added antique New England buildings he purchased to recreate an 18th-century Victorian village on the site. He opened it to the public but Schmitt’s vision only met with modest success. Three years after his death in 1998, developers purchased Johnsonville and tried turning the property into a 55-and-older living community and then a luxury retreat, but those plans never came to fruition. “Greetings from Johnsonville Village: The Digital Archive of Connecticut’s Victorian Outdoor Museum,” 2015. Link. “Moodus Mills.” East Haddam Historical Society, 2015. Link. “East Haddam Historical Society & Museum,” 2017. Link. 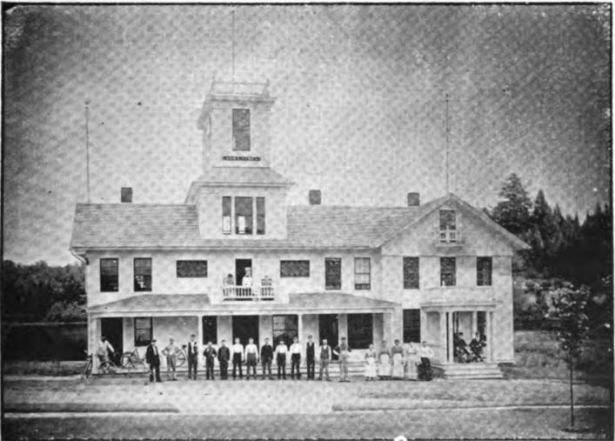 “Catalog Record of the Neptune Twine and Cord Mills Records, 1814-1964.” Connecticut Historical Society Library Catalog, 2015. Link. “Emory Johnson.” In History of Middlesex County, Connecticut, with Biographical Sketches of Its Prominent Men. New York, NY: J.B. Beers & Co., 1884. Link. 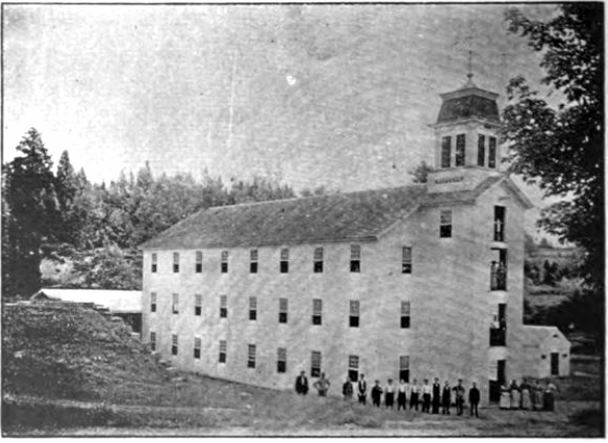 “The Neptune Mill.” In Fibre & Fabric; a Record of American Textile Industries in the Cotton and Woolen Trade, Vol. 35. no. 885. Boston, MA, 1902. Link. 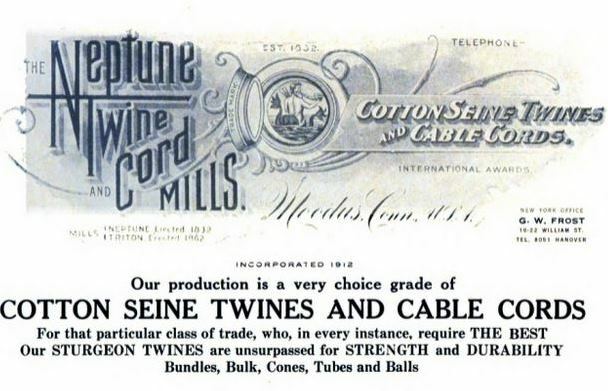 “The Neptune Twine and Cord Mills, Inc.” In Public Documents of the State of Connecticut, 1903, Vol. 1, part 2. State of Connecticut, 1904. Link.